This 'Laing' built family home has undergone a programme of extension and refurbishment over the years by the current owners and now offers a peaceful relaxing environment for the family. The ground floor accommodation has been extended to the rear and is now home to a beautiful grey and white high gloss kitchen with granite work tops and a two seat breakfast bar. The garage has now been converted and adjoins the new extension to form the new downstairs shower room and bedroom 4/study. The rear garden offers a secluded retreat with lush green lawn, mature boarders and patio area. The front provides off street parking. Stanmore is a leafy, tranquil suburb in North-West London situated between Edgware and Bushey. The last stop on the Jubilee line, a journey to Bond Street from Stanmore takes 31 minutes. 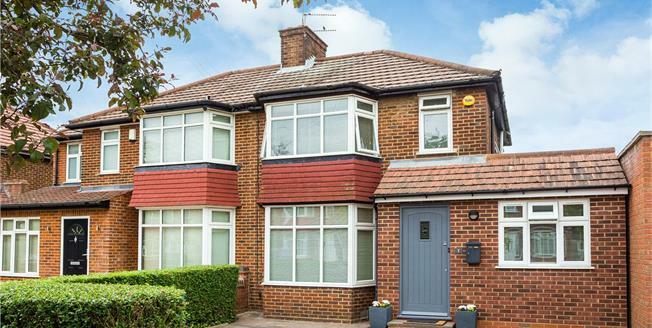 As an area Stanmore boasts an abundance of greenery, charming commons and acres of Green Belt. It is one of North West London’s most desirable areas due to its boutique cafes, shopping facilities, and location to prominent state and private schools which include Haberdashers’ Aske’s, North London Collegiate, St. Margaret’s, and Stanmore College.